← Earthworm Watch needs you! ‘What a wonderful day getting back to nature. From the folk behind the award winning Elderflower Fields Festival and the innovative Schools Without Walls programme comes the second instalment of Into The Trees. Into The Trees is a fascinating family day out which takes you into the amazing world of trees, woods and forests and will open your eyes to the ways in which we can play, work, learn and explore amongst their leaves, branches and trunks. Taking place in the heart of one of the south of England’s most amazing landscapes, Into The Trees offers the rare chance to explore and enjoy protected ancient woodland in the Ashdown Forest. Working in the trees – demonstration and craft workshops from skilled blacksmiths, tool makers’ trug and basket makers, and more. 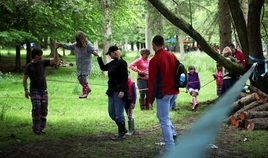 Playing in the trees – explore the tree canopies and play in the branches with climbing and slacklining. Enjoy woodland storytelling and games in the trees. Art in the trees – create wonderful works of art with your family from wood and browse beautiful work from local artists. Living in the trees – explore ways in which we can live within the trees. Get mucky with the kids and try mini mud hut building or check out the tree tents or Woodland hut company or Mark’s True Tiny House. Wildlife in the trees – Join some of our brilliant experts from Sussex Wildlife Trust and other partners to learn more about the wonderful wildlife in the woods. Surviving in the trees – discover ways in which we can survive in the woods with bush craft skills, foraging and more. Into The Trees returns after a fantastic first year. Held over 2 days, Into The Trees will inspire even more generations to spend time outdoors with their families. The team were blown away with all the positive comments from the first event, this year they promise two even more captivating days in the woods. A real chance to enjoy the wonders of nature, Into The trees will bring experts from the world of wood to demonstrate and inspire guests of all ages. ‘Rope swinging, pond skimming, slacklining, wood working.